What Does “TV” Mean in 2018? You’re in bed watching NBC’s “This is Us” at 11pm on your phone. Are you watching TV? Or, maybe you’re sitting in your living room watching short video clips on YouTube on your 60” Smart TV. What are you watching now? 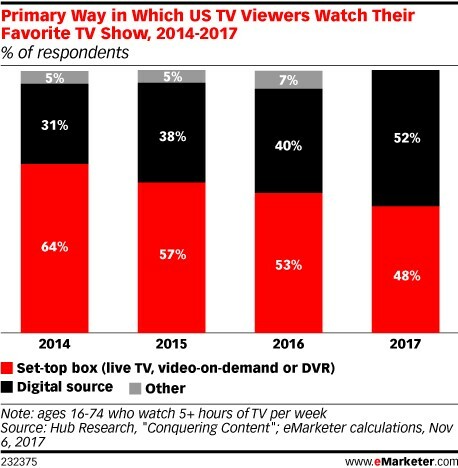 Consumers are watching video content in various ways distributed by multiple sources, and the landscape is getting blurry. More and more, video content is being distributed through digital sources. According to eMarketer, that figure increased 12% from 2016 to 2017. Why does it matter that we spend time considering the changing video landscape? It matters as marketers because it’s our responsibility to lead our clients in meaningful discussions in how to best invest their marketing dollars. We need to help them understand which media tactics matter, and why, and not get caught up in the buzzwords. How do you lead that discussion? Talk about what matters. Once you’ve already determined that video is part of your communications strategy, what matters most is audience, scale, and proper creative assets. Target audience definition has always been key to marketing, and now there are multiple ways in which to reach an audience: Broadcast TV, Advanced TV (OTT/over the top or connected TVs), video display, and cable/satellite. With OTT (streamed video content transmitted via internet, across any device. Ex. : HBO Go, Hulu, Netflix, YouTube, apps that allow for video viewing), you open the possibility of adding data layers to demographic targeting, and the potential for clicks, although that is rarely going to be a wise KPI (key performance indicator). Generally speaking, the KPI for video is video view completion rate. You also increase potential reach by getting in front of cord-cutters and cord-nevers, who are consumers who were never cable or satellite subscribers. More and more, audience is fragmented. Meaning, fewer people are watching one thing, and they’re watching things on their own schedule. This is called time-shifting. Aside from big events like major sporting events, specials like award shows, season premieres, and finales, much of consumer viewing is on-demand through a smart TV, app, or digital video recorder. This requires that your video buy accommodate and grow with the times to capitalize on this change. In short, audience matters far more than the method in which they watch. We want our client’s message to get in front of the right audience, no matter where they’re viewing video. It doesn’t matter HOW the video is delivered, or what we call it. The biggest strength with broadcast TV is scale. But, with more and more content providers like Netflix and Hulu offering more, audience is naturally becoming more fragmented and harder to find at viable scale, especially when you’re talking about local market campaigns. Not only is there video content fragmentation now, but it’s expected to grow exponentially, year over year. According to a whitepaper produced by Cisco, in just three years (2021), it would take someone more than five million years to watch the amount of video that will cross IP networks in just one month. The internet might have been born from cat videos, but now you can find how-to answers on almost any topic you can imagine! To create scale, you need an aggregator to pool many networks, programs, and platforms. Most connected OTT inventory that’s available is sold through aggregators, and media planners need to stay in-the-know in terms of which companies to talk to for certain networks, data, and audience delivery. To get the scale a campaign needs, you might need to skillfully combine reach and frequency achievement of TV, cable, and other digital video sources like OTT together. If you’re focused on only one, you might not hit the desired audience reach and frequency. It’s very important to understand the big picture so you can make the pieces come together effectively and efficiently. If your video length isn’t customized for each platform, you aren’t optimizing your customer experience. But more importantly, if your creative asset length isn’t optimized to the strategy and objective, you’ve missed the mark completely. Longer spots are necessary when communicating a new brand or idea, but they should also never be one second longer than is needed to include only important story elements. If your objective is a simple reminder of a brand or message, the shorter, the better. But, if you have a new brand or product, short spots are a waste of money because you can’t communicate everything necessary without enough time. There is a balance that needs to happen between sharing information and our incredibly short attention spans. Your video spot length should be dictated by communications strategy and platform, and your media professional should know the best way and place to find the right audience for the asset. In summary, it doesn’t matter what you call the method of getting your video in front of an audience, be it broadcast, cable, “OTT” or just “video.” What matters that you have a good strategy for using video and that your media professionals know how to buy it. We want our client’s message in front of the right audience, at scale, no matter where they’re viewing video, and with the shortest possible video length to communicate what’s necessary. Good media planners can navigate how best to buy across all available options, no matter if you call it “TV” or “OTT.” Once you decide that video is part of your marketing communications strategy, you strip away the labels, because they only matter in how these things are bought and sold, and less in how they are consumed.